Color me completely fascinated by all the tales of selling on Etsy that rolled in after I asked you wonderful folks about it from my newsletter. Are there two types of Etsy sellers? Does it boil down to hard work? Thoughts on hard work by creative entrepreneurs. Success stories that show a peek at the hard work. And today’s post, where I share the comments that started it all. I considered editing these down, but ultimately decided that having a variety of stories with all the info was valuable, so below is the big dump of our readers’ Etsy pros and cons. These are not the views of Aeolidia, but the opinions of individual (anonymous) Etsy sellers. Below, I include some advice and information I sent as replies to these thoughts. If you’d like to set up your own shop outside of Etsy, we wholeheartedly recommend Shopify, Etsy will let you export your items into a CSV file, which can then be imported into Shopify. Use our Fee Calculator to see what this will cost your business. I have been on Etsy since 2005. The very early stages of their creation. During that time I was creating full time and selling many items with very little inventory. Etsy has been great for me. I unfortunately do my creative business part time now. I would eventually love to go full time again. I just need to be ready, mentally to take the leap. It takes a lot of promotional work to be successful on Etsy. Usually a lot of listings helps with sales. Some people have commented that 100 items helps with being found. I find this incredibly hard to do as an artist when all of my items are one of a kind and I do not use any manufactured items to create my pieces. Great photographs is a must and descriptions help with search engines. This also takes an incredible amount of time away from creating if you are a woman show like I am. You also need to spend time to promote your Etsy shop: Facebook, Etsy Teams, Wanelo, Twitter, Tumblr. I also feel Etsy fees is economical. I have heard when you have a large amount of inventory and you need to list and relist, Etsy can be expensive. That is my take on Etsy. How to focus our energy on something that will pay off? Fairly easy to post new items, tag, ship etc. My experience is that I have found Etsy to be a lost cause. I have added my products on there multiple times without any success of sales. I feel that I am a needle in a hay stack. I have even typed in a search for “personalized plates” to see if my products pop up on the list and NOPE! There are pages and pages of personalized plates and only the newest ones added to their site will show up. What customer is going to look through 12 pages of plates to eventually order mine? Statistics show that most people shop on the first or second page. My guess is the people that have a good following already, where their customers know their Etsy shop specifically get the orders but for me just starting and growing my business, Etsy is a lost cause. I have tried paying for an ad too, so I could be listed near the top but didn’t see any results. I hope this feedback helps and I look forward to your article to see how other businesses feel. We currently sell almost exclusively on Etsy for ready made products and customizable work – greeting cards, love notes, and what not. Our totally custom work (for now!) is all word of mouth referrals. My Dad didn’t win Salesman of the Year for nothing! Product listing set up is SUPER easy. You can create a listing in just seconds, and copy them as you add more to make sure all of the needed information stays the same. Win. You can easily download all of your sales and financial stats – everything from sales by item to fees by fee type. It makes end of month finances very easy. Export. Save. Done. Etsy generates (some) traffic for you. When we started, we relied completely on Etsy generated traffic, and we still rely on it quite a bit. It’s easy to see how traffic is generated – Is it Etsy generated? Are they connecting from our website? Finding us through Google or a blog we were featured on? The mobile app is incredibly helpful – for buyer communication, listing updates, and (compulsive, ehh, I mean weekly) stat checking. The market – every market it seems – is saturated. And if you feel original, I guarantee you’ll have an imitator in not too long. The fees, although they feel small, really add up. A listing fee + a sales fee + a credit card fee (either through Etsy Direct Checkout or PayPal) and a good chunk of your sale is gone. We price to cover most of it, but man, it still hurts to see those totals at the end of the month. Etsy makes it easy to feel like you’re not selling enough. Like you’re not enough. You see featured stories about people selling thousands of items on day ten of their shop going live and haphazardly quitting their day job to keep up with the demand, and you feel like you should be able to do that too. Except, for some reason, you’re not. They’ve lost their handmade touch. Need a particular piece of jewelry? You’re likely to find several “sellers” selling it so cheaply that 1) it’s clear they aren’t making it by hand, and 2) the people who are making it by hand, trying to make it happen, can’t compete. Etsy is a good place to start. It’s easy, it’s relatively cheap, and you don’t have to supply all of your own buyers. If you don’t like it, or you find running your own business just isn’t for you, then it’s easy enough to shut down and move on. Overall, I think Etsy is best for someone who genuinely loves being crafty and wouldn’t mind making a few extra bucks selling their wares. Even for them, however, it can be hard to compete with the big Etsy sellers. From my perspective, it isn’t somewhere that, beyond being one place you might be “discovered”, is overly beneficial for makers who are truly trying to rule their creative world and create a sustainable and successful business. But that being said, it’s hard to re-create the traffic and ease of selling that Etsy can bring you, if you were to sell from your own site. We’ll stay on Etsy. But we’ll also (one day!) move to a site hosted shopping cart so that we can also sell directly. Once the direct sell takes off, we’ll have to see if it’s worth keeping both alive, or if one day it will be time to say adieu to Etsy. But that day is not today. To be honest Etsy did work for me in the beginning in 2010 when I started my business. In the last two years or so it hasn’t worked as good for me. I just launched my new website and hoping for better results than Etsy. Jewelry is a saturated market and it is hard to be found on there. That being said the fees aren’t an issue because I believe that cost is part of running a business. I have had a shop on Etsy since 2008 and I’ve seen a lot of improvements and policy changes- for better and for worse. I love that Etsy provides tons of tools and advice for their sellers, overall it is a very positive and helpful place. Also I have met a lot of talented makers and loyal customers through my shop. What I dislike is that Etsy is now synonymous with “bargain.” I think Etsy tries to shrug that off from time to time by featuring higher end shops, but that is the general vibe I get from their site. Especially now that having designs manufactured on a large scale (and no doubt mostly overseas) is acceptable practice on their “handmade marketplace.” I think they have done a lot of damage to the term “handmade” and to what I like to call their “real estate value” – I feel like my work is somewhat devalued because of the cheap goods that surround it. And the culture Etsy has created…. I am a person who strongly values well designed and crafted work and I think makers of these goods should be compensated for their skills and I expect to pay more for that – just like when I choose an organic option at the grocery store – I understand why that apple costs a few cents more. It is dishonest to promote “handmade goods” if they are in fact made by individuals who are working for slave wages. It’s not just Etsy where I have seen this but when I participated in the very first Unique L.A. (trade show) in 2010 there were SO many venders who “designed” their work in the states and had their products manufactured elsewhere – to the point that one booth selling leather handbags had tags that were stamped “made in China!” There were so many venders selling poorly made goods that were not neither unique nor created, designed or in anyway associated with L.A.. This is what we encounter and expect at the mall or Target but not at a juried show who promotes “made in America goods.” I mention this because I think Etsy has promoted this culture by at first admitting these sellers on their site and now promoting and encouraging this harmful practice. Since my beautiful website went live, a little over 6 months ago, I have been wanting to break up with Etsy but I keep making sales there! I haven’t figured out a strategy that will allow me to leave this bad relationship and lure customers to my own site and I am hoping your article will provide some ideas from other sellers. As for Etsy, I see it can be daunting, but the things I like about it still are that it is easy to use and inexpensive. I also think that it has been around so long, that it is now the go to place for unique and innovative items. I do not rely on Etsy to drive traffic to me. I have worked on other ways to get the word out about my handmade goodies… We blog and I think that helps people get to know us and our brand. We also participate in handmade markets, where I always have my business cards on hand. There are other things you can do to put your shop in the spotlight- Etsy Conversations podcast is a great way to talk about your shop! I did this and it was really a fun way to get the word out. I have used Search Ads on Etsy. I notice these give me a bump on views and sales. These are good because you can spend as much or little as you want on them. We have been using Etsy for the last two years. It has become a huge part of our business. Here is my experience thus far. Nice community – the Etsy shopper is friendly, engaging and understanding. Great store design, every store feels like it belongs. Listing fees are reasonable as well as the length of time a product is offered. Easy to update inventory or edit a listing. Payment options for the customer are good. Communication avenues are good both with Etsy and our customers. I have been tormented by Etsy and their general platform lately. I am a fabric shop, and am phenomenally grateful for the business Etsy has helped me build, but I feel like lately something in their algorithm or who knows what has changed. The beginning of March went gangbusters, and now I’m lucky to be doing 1/2 of what the first of the month was in daily sales. I’ve reached a ceiling on being able to “grow” my sales there beyond about $15k/month. Now, I’m sure some people would think, “what the heck is wrong with that? !” but the margins on fabric are low, and even lower once you factor in all the Etsy fees, Search Ads that we pay for (I don’t have the guts to find out what would happen if I discontinued those, so we keep plugging away with about $200/mo going to Etsy for that feature), etc. etc. My fees are in the range of about $1,000/mo, which still seems outrageous to me. I feel frustrated that I can’t get our little shop to grow beyond what I think Etsy has determined to be the “ceiling” and am looking for another avenue. I opened my Etsy shop last July. Having no blog, Facebook account (or any other social media account for that matter), and no email list – which obviously meant I had zero followers of my own. I can honestly say that starting on Etsy has been absolutely critical to my progress as a brand new business. A lot of people – I mean A LOT of people! – go to Etsy before they turn anywhere else to purchase. Would customers ever have found me if I had just started on my own website? It’s pretty doubtful. Not to mention, that setting up and maintaining my shop on Etsy is so incredibly easy, that it’s really saved me a ton of time as I’ve adjusted and fine tuned the products I offer. Everyone’s experience is different, but for me, I see Etsy as the best place to experiment and perfect my business and products before spending the time and money to launch my own website… which yes, I most absolutely plan to do in the future! I know a business is constantly growing, adapting and improving so my goal isn’t necessarily to wait for my own website until I think everything is perfect but rather to make sure I’m headed in the right direction. I want my website to house my tried and tested products and reflect a brand and business that is right and true for me! I think I’m almost there, and I’m so grateful for everything I’ve learned through these last eight months that have brought me to this point. It has been such a necessary part of the process for me, and I truly have Etsy to thank for it! All said and done, however, Etsy isn’t ‘my own website’ and certainly is missing some things that would I would love to have. They’ve now made it really easy for someone to “Like” your Facebook page or “Follow” you on Twitter. But since I spend most of my time on Pinterest, I’d love to have an easy way for customers to follow me there. I also have had little success with building a mailing list. I think someone is a lot more likely to fill in their name and email if it’s right there in front of them – just type and click Submit. It’s possible to include a link to your sign up form in your Etsy shop announcement, but unfortunately that requires them to take the time to go to your sign up page. And often times, people browse through your shop without ever actually seeing your main shop page and shop announcement. I’ve used Etsy in the past. I only use it now to list one item just in case someone comes across it they can get directed to my website which has my growing catalog of work… including custom work. I never liked using only Etsy as my business because I’d rather grow my own site and traffic and newsletter rather than Etsy. I’ve known people who have had shops shut down and others were forced to refund because Etsy said so even though in their own profile it says no refunds on custom orders. BUT most importantly when someone asks “Where’d you get that?” I want the answer to be this cool artist named So-and-So” rather than “I got it on Etsy.” Etsy is just a step to get someone over to my website really along with Facebook and other social media outlets. Well, I’m going to have very little to say about Etsy, but maybe it will help. Bottom line is I have a store there on “permanent vacation”. Just haven’t gone over there and closed it all the way down. It was a time waster and $$ waster. My particular market (bath & body) is wayyyyyyyy too saturated over there. With the eleventy-zillion bath & body makers over there, no one would/could ever be able to find me. I’d rather spend my time trying to come up with unique keywords and descriptions on my own domain (which I have), rather than fight the Google monster in both places. Like Facebook it takes too much time to try and reach new customers. My regulars know where I am (locally and online). So it made no sense. I stuck it out for a bit hoping to use it as a vehicle to get my business name recognition. But no return. Not one sale… just my $ to them. With so many “free” websites out there, it seems crazy to me to sign up with what Etsy has become. As a business grows, or if it can afford a design team to create that killer web site that’s the way to go… but as a start up with no or little $ to work with AND if your niche is crazy full with hobbyists and business people… I say strike out on your own and forget the monster that is Etsy. I find I struggle on Etsy. I have very low sales, but I’m surprised I have any at all my views are so low. I will assume my products are ok as I sell quite well on other sites so I assume it’s because my SEO is dreadful on there. I don’t really understand Etsy SEO and wish there was a paid service for help with this area! In regard to Etsy, I’ve talked a lot about the pros and cons of Etsy. I’ll include the main ones I share below in case you want to check that out! I think for me as my shop has grown it gets harder and harder to pay the fees. I hate to see so much of my profit go to them. With that being said, I still make the majority of my money through Etsy. I have a shop on the Shopify platform and it doesn’t get near as many sales. I’m hoping to change that this year but I’m having to research ways to get my customers there. On Etsy, they bring the customers to me, which is nice! IT’S EASY TO OPEN UP SHOP. Setting up your Etsy shop is so easy and can be done in a matter of minutes. There aren’t many options for customization, which you’ll later see I mention as a con, but it does make for a quick and easy setup. They walk you through step by step until your shop is ready to go! With the exception of the $0.20 listing fee there are really no start up costs other than your time and product production. SHOP MANAGEMENT IS VERY EASY. Once you have your shop all set up, it’s pretty easy to complete the other necessary tasks of running an online shop such as printing shipping labels, uploading photos and communicating with your customers. ADVERTISING. There are hundreds of thousands of Etsy shops out there so it can be pretty intimidating. Etsy makes it super easy to advertise and you get to set your weekly budget. I have set my weekly budget at $7 for quite a few months and it has been surprisingly effective. It pays for itself each and every week. LARGE AUDIENCE. Etsy is probably the most well-known eCommerce platform out there and they have a good reputation. Its users trust the site and you can expect to have a pretty smooth experience. Because Etsy is available to customers all over the world, your products are in front of a worldwide market, reaching people that would be difficult to reach on your own without that platform. STATISTICS. Up to date statistics are available making it easy to track how visitors and customers are finding you. Use the keywords to your advantage. DIGITAL PRODUCTS. Etsy makes it really easy to sell digital products. You just upload the file, list the product and then people can buy it and download instantly. The transaction is pretty painless and money comes in without you having to do a lot of work. ETSY APP. This makes it easy to respond to messages and list, edit and renew product listings on the go. Also, the cha-ching it makes with every sale, alone is worth it. COMPETITION. There are hundreds of thousands of Etsy shops. Not to mention the countless other shops using different platforms. It can be an extremely defeating process to get your listings to stand out, especially in the beginning. BRAND RECOGNITION. I think this is one of the biggest downfalls to selling on Etsy. When asked where they got a particular item, instead of sharing the shop or artist’s information, they simply say the item was purchased from Etsy. They tend to lump all Etsy sellers into one group, making it hard to make a connection. VISIBLE NUMBER OF SALES. Your sales are on display for everyone to see, as well as the date you opened your shop. The number of sales you have gives new buyers confidence in you. If they see you have hundreds/thousands of sales they might be more likely to buy since others have as well. This obviously can pose a problem for new shop owners. It may take awhile for your sales to start growing, but I promise, once they do, they won’t stop and your visible sales number will become a positive. MINIMAL CUSTOMIZATION. All Etsy shops are formatted the same way. With the exception of your shop banner and listings, there isn’t much opportunity to distinguish your shop from others on Etsy. You have to really go the extra mile to make sure your brand is communicated. FEAR OF NEGATIVE FEEDBACK. You can talk about your policies until you’re blue in the face. You can put it all in writing but when it comes down to it, people do not read and most likely will miss about half of what you share in your listings or policies. I have, on more than one occasion, broken the policies to avoid negative feedback. It’s always a good idea to go the extra mile for a customer but it can be frustrating to eat the cost of a customer’s mistake. EXPENSIVE FEES. As your shop grows, so do the fees. 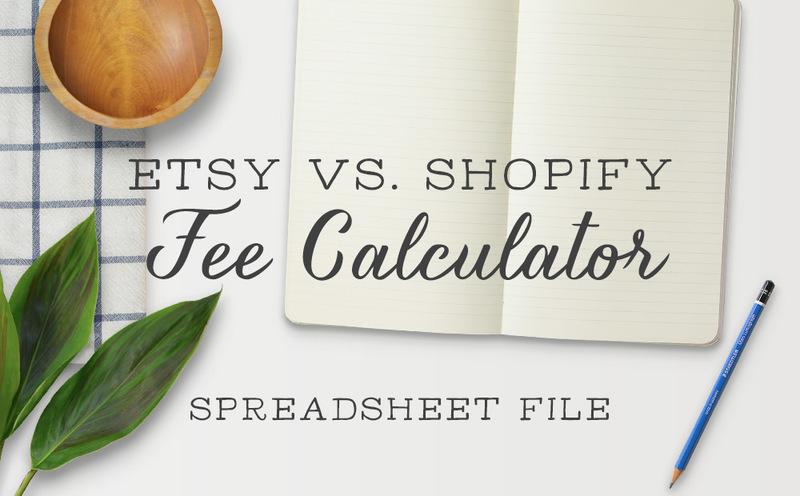 Etsy charges fees for listings posted, transactions and then there are PayPal or credit card fees. As you grow it may be more beneficial to sell on a platform that offers a flat rate service. However, keep in mind, you will be responsible for getting people to that site. Etsy does a lot of work on your behalf to generate traffic. I am growing increasingly frustrated with Etsy, I joined early on with my first shop and got a lot of exposure but as the years have gone by so has my visibility. With my newer vintage shop it’s been even harder to establish a presence. The pros of Etsy were that they do the heavy lifting for you with the marketing and web presence but I can’t really say that anymore. I’m definitely ready to take the leap with my own e-commerce website for my vintage boutique. I am having really bad luck with Etsy. I have now been actively using it for almost a year and I have yet to have a sale come to completion. I have had custom orders that people never paid me for, but no completed sales. I am a very small start up business. For me my Etsy pieces are a side business to my illustration work. I originally got on it to sell off my overstock from local craft fairs, but I have had more luck through local word of mouth. I feel that even when I pay for search engine optimization I am not getting many click overs and no sales. I feel like a small fish in a giant sea who is getting lost. I have tried reworking my site and I am once again in the middle of a revamp, but sometimes I wonder if Etsy is the right place for a really small business. My ultimate goal is to find a local store I can sell wholesale to. So for now Etsy really serves as a place I can show my wares to people or direct them to see what I do. I have been keeping it like this since my fees remain low. For my illustration work I use Behance and I am having more luck with that site getting views even though I have yet to do any real promoting to it. I have an Etsy shop. I started it five years ago and it’s been growing steadily. Etsy was a great place for me to start since I wasn’t raised with computers and had a LOT to learn about the internet. In that respect, Etsy has been terrific. It felt like a nice safe environment with the help, suggestions and support of a community of crafters whenever I got stuck – thank you Etsy forums! But it occurs to me that I might be missing out on a lot of people who would prefer not to shop on Etsy, or would prefer to not have to set up an account in order to make a purchase. My shop isn’t so big that I’m paying ‘huge’ seller fees, but I find Etsy’s listing options to be limiting. I think that’s my biggest challenge right now. It would be great to have alternate ways to offer my products to customers – ways that would make it easier for buyers to purchase the color/size/quantity needed. Getting found on Etsy seems like it can be a tricky thing! If you haven’t seen this article from Etsy, it’s a good starting place. If you’re considering a move from Etsy to Shopify, Etsy will let you export your items into a CSV file, which can then be imported into Shopify. You will probably need to do quite a bit of work cleaning everything up and adding images back in. Many of our clients who sell from multiple venues (Etsy, Shopify, craft fairs, etc.) use Stitch Labs to manage inventory. If you’re getting good traffic from Etsy and thinking of moving, it’s worth considering either keeping both shops running (with inventory managed by Stitch Labs), or putting stronger efforts into generating your own traffic for a while, to see if it can be done. The thing is, you’re not going to want to pay for advertising or SEO to point to Etsy – you want to pay for traffic to go to your own domain, so you don’t lose it when you move. There’s a fine line where it stops being inspirational and just becomes frustrating, I guess! It would be helpful if all their inspirational stories really helped other sellers with a “how did it happen” kind of insight that they could apply to their businesses. Of course, this all ties back to the first post of this series – are these people just falling into success like this, or are they working their butts off behind the scenes to get to where they are? Even if some people do just stumble on success, is that the type of business that you want to have? Or would you rather have a business that was built slowly and carefully, and is more resistant to changes in trends? I would worry that a business that blew up overnight could just as easily fail in a hurry as well. Do you sell on Etsy? Which stories above do you most relate to? Do you have a story of your own, or any tips or advice to offer new or struggling sellers? I sold on Etsy for several years with great success. So much so, I couldn’t keep up. I was working about 80-90 hours a week; and even though I had two virtual assistants and someone to help pull + ship orders it was extremely stressful. At the time Etsy did not allow help in manufacturing or order fulfillment. Just answering 150+ convos a day was intense. However, all-in-all it was a great experience and one I’m forever grateful. I’m on Shopify now and really like the platform. Although I’ve found organic (unpaid) SEO is close to impossible on Shopify. So be prepared — it’s never too early to start if you are planning on leaving Etsy. I’d suggest you run both sites to get a feel for your own domain. Shopify is affordable and the tools (called Shopify apps) include anything you could dream up to run your business- newletter ingration, sold out notices, abbandon cart emails, etc. I highly suggest having your own site; in conjunction with Etsy. I know it’s a lot of work, but there are a few that can simply the process (my favorites are Stitch + Ship Station). The one thing I miss about Etsy is the community — it’s amazing! The Shopify community is supportive and growing, but it’s not the same crafty, creative crew. It’s interesting to read these different perspectives on being an Etsy seller. I agree with the idea mentioned several times that Etsy is a great place to start out. My store and the things I sell look totally different to when I started 2.5 years ago. Etsy has been the perfect platform for me to experiment, learn and make lots of mistakes. I think Etsy is a great place to find out if there’s a market for your product and to refine that product and your brand before you take the leap to your own site. Yes, it’s great to have a low-risk way to do that! I started my shop on Storenvy b/c I’d failed big time with a hobby on Etsy years before and I design graphics and print t-shirts and it seemed like Etsy wasn’t the right market for that when I started. Now I run both a Storenvy shop and an Etsy shop, but pretty much only promote the SE shop, since there aren’t any fees beyond what Paypal takes. I find the stats Etsy gives me to be more interesting & helpful than what SE provides, but I have pretty dismal views on Etsy and 1 sale in 3 months, but you could attribute that to not promoting it, I suppose. Thanks for sharing your experience, Tessa! Great article, I found this awhile ago when helping my sister research about setting up a web store. Her needs were really simple, she just wanted an online store to post some products and to be able to accept credit cards. Most of the existing stuff was too expensive or complicated for what she needed. So I built a really simple web app for her to do that. Pingback: Thinking of Selling Your Work Online? Really a nice read. Cons are more than pros. I was a seller with etsy. Suddenly after one and half years they closed my shop without even bothering to let me know. My repeated mails returned no reply. Finally I discovered a similar site itshandicraft.com and I am very happy selling here. The listings for first two months of joining are totally free, so no harm in trying.